I awoke this morning to see two more houses on my block had just put up a great display for Halloween including Halloween outdoor lighting. Although I’m glad they are lighting up the street, I had to wonder if it was really worth their effort being only a week away from Halloween. Both of the houses used orange string lights so they certainly can not be used for the Christmas holidays. Just a week from now, they’ll be saddled with the task of taking them down. I remember with great fondness the couple of years I forced myself to decorate my front yard for Christmas. I say couple years because the other years I used excuse after excuse not to drag out the ladders and string of lights, and trips to Target to get replacement bulbs. Not to mention extension cords and time spent outside that I could be relaxing on my weekend. Our new holiday line takes care of the holiday decorating stress and struggle. We do everything for you. Here’s how easy it is. We come to your home at a scheduled time. You select what you want. We order, deliver and install. Then, after the holidays, we take it down and store it. All you have to do is pick out what you want. Only 61 days til Christmas!! 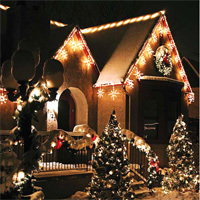 This entry was posted in Christmas Lighting, Holiday Lighting, Nashville Christmas Lighting, Nashville Holiday Lighting and tagged Nashville Christmas Lighting, Nashville holiday lighting, outdoor holiday lighting by outdoorlightingnashville. Bookmark the permalink.